The chicks are now quite mobile and have been off exploring the walkway around the base of the spire. They do not spend much time in the nest tray, perhaps because they go on to the north side of the tower where there is more shade. 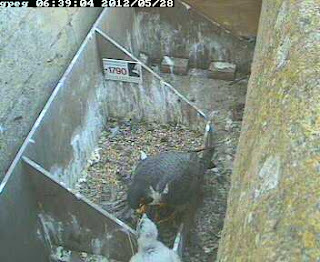 They come back to the tray occasionally and the photograph below shows one being fed by dad early this morning.